The Chinese porcelain ginseng cooker is traditionally the way the Chinese people have prepared ginseng roots. 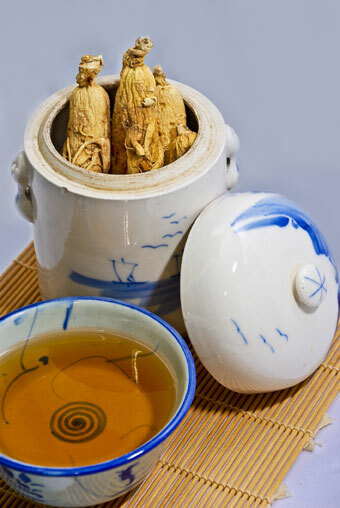 Ginseng cookers are a method of preparing Ginseng tea that conserves the subtle properties of the root. This traditional method involves the use of a double boiler, which is known to produce a more robust, full-bodied and potent brew. When Ginseng is prepared in this manner, many of the essential nutrients of the Ginseng, which normally dissipate in steam, are preserved. An added benefit of this method is that because the tea remains below the boiling point, photo-nutrients are retained that would otherwise be lost by boiling. We sell two cookers, choose either a 5-cup or 10-cup capacity; click the below links for more information or to purchase. Our porcelain ginseng cooker is sold in two sizes—choose from—a 5-cup or 10-cup cooker. The cost ..